Dogs make the best workout buddies. They never complain about hills, or cancel on you last-minute. And they’re always stoked to follow you out the door. That energy can be contagious: research from Michigan State University found that canine owners were 34% more likely to get the recommended 150 minutes of exercise a week than folks who didn’t have a dog. Even if you’re just taking your pup for a walk, that counts. (Move at a brisk clip and you can burn as many as 170 calories in half an hour.) But there are lots of other activities you and Fido can do together—all while strengthening your bond. 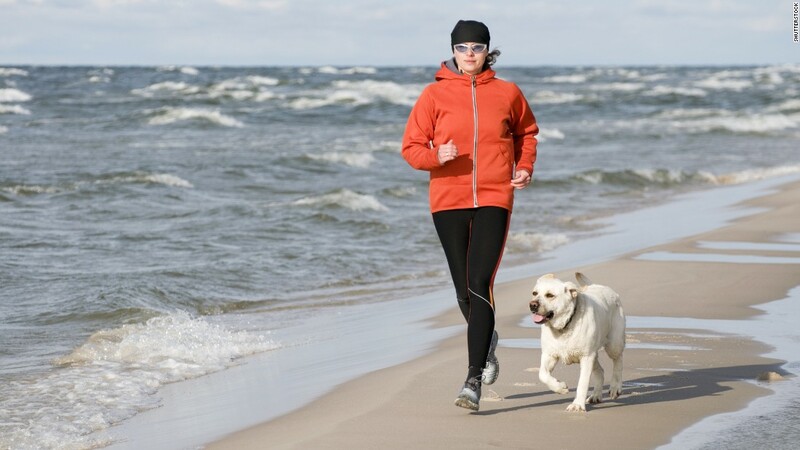 Concerned your little pooch won’t keep up? No need to worry, says Clough: “The truth is most small dogs have more energy than the big breeds.” Just be careful in the heat and humidity, since dogs don’t sweat like we do. And if you have a flat-faced breed (think pugs and Boston terriers), keep your runs under five miles, Clough suggests, since these dogs have a harder time taking in air. Is your dog so exuberant on walks you worry she might one day pull your arm off? If so, try letting her keep up with you as you pedal: “Biking is perfect for dogs with tons of energy,” says Clough. “They are totally psyched to flat-out run.” Meanwhile, you’re getting a great workout (cycling can torch 500-plus calories per hour) and building your leg muscles. If your girl likes chasing squirrels and skateboards, consider using a device called the Springer. It attaches the leash to your bike’s frame or seat stem and absorbs much of the force of sudden tugs ($130; amazon.com). Biking with your dog may actually help with any behavioral issues she has, Clough adds. “The biggest problem I see with dogs is that they’re not getting enough exercise.” Indeed, veterinarians at Tufts University’s Animal Behavior Clinic say aerobic exercises timulates the brain to make serotonin, a hormone that helps dogs, especially those who are anxious or aggressive, to relax. You throw the ball and your pup goes bounding after it. But who says you have to just stand there? While he’s retrieving, bust out some muscle-building moves like crunches, lunges, squats, and more—until you’re both panting and worn out. Better yet, race him for the ball and squeeze in some sprints. Fetch can be a game you play, too. Believe it or not, some dogs love soccer—especially herding breeds like Border Collies and Australian Shepherds. Pet brands sell soccer-style balls (resistant to sharp teeth) in different sizes, like the 5-inch Orbee-Tuff ball from Planet Dog ($20; amazon.com). Once your boy learns to “kick” or “dribble” with his nose or paws, get your heart rates up with keep-away, or by punting the ball and racing for it. Thanks to the vertical element, climbing stairs (or bleachers) makes your quads, hamstrings, and glutes work extra hard. You’ll tighten up your lower half, while Spot burns off the biscuits. It’s almost as if stand-up paddleboards were designed for canine co-pilots: Dogs of all sizes can ride on the nose (while you get a killer ab workout). Pick an ultra-calm day on a lake or bay for your first excursion together, so your pup can develop his sea legs. If you’re struggling to balance the board, try paddling on your knees, which lowers your center of gravity, until your dog is comfortable. Still, odds are you’ll both take a dip, which is why Clough recommends outfitting your dog with a life preserver. It’ll make it easier for you to lift him back onto the board, too: Most doggie vests have an easy-to-grab handle, like the NRS CFD (from $35; amazon.com).